Want to lose Weight is your choice food or fad? Typically if you lose weight quickly by replacing food with shakes, supplements or pills you will lose weight because you will be eating less calories but not only are you losing lbs in weight you will also lose muscle and you will spend a fortune. I know why people do this because they are desperate to lose weight but if you do something that you can’t sustain for life the chances are that you will put the weight straight back on and get into a costly cycle of yo-yo dieting. Seeing an advert for Yokebe shakes at a minimum of £10 for a tin didn’t make me feel I would be looking forward to my next meal. So if you would like to learn how to eat ordinary food but still get extraordinary results then check out http://www.weight-away.org where for less than than a tin of Yokebe you can join Weight Away for 1 month and receive help support and delicious recipes. Trying to lose weight -Are you giving up anything for Lent? This week sees us starting the religious build up to Easter with Shrove Tuesday known as Pancake Day, followed by Lent. This starts on Ash Wednesday for approximately 6 weeks until Easter Sunday which this year falls on Sunday 26th March. The traditional purpose of Lent is the preparation of the believer through prayer,penance repentance of sins, almsgiving, and self denial. So whether you are religious of not, if you decide to deny yourself something you enjoy, this can provide a focus for you to kick any problem you have with eating. Personally I find chocolate hard to resist and although I am careful to only eat it in small amounts I think it is easy to become complacent and just start having a bit more and then of course this can become a slippery slope. I have decided therefore to give up chocolate for Lent. This not is not for religious reasons but just to keep my chocolate eating in check. I am no saint however as I have had a dry January giving up Alcohol during January up to my birthday on 14th February so while I will not be eating chocolate I will be able to have a glass of wine. If you are having a pancake on Tuesday you might find this a useful lower calorie recipe. Place the flour into a bowl. Beat the egg, milk together, and then slowly add to the flour. Stir the mixture until a smooth batter forms. Leave to stand for about 20 minutes, and then stir again. Brush a non-stick frying pan with the olive oil. When the oil is hot, add 2 tablespoons of the pancake mixture and shake the pan so that it spreads. Cook the pancake for 2 minutes, or until the underside is lightly browned. Flip over and cook the other side for a further minute. Keep the pancake warm while you cook the rest. The mixture should make 8 pancakes in all. Divide the pancakes between 4 plates, top the pancakes with the mixed berries and yoghurt and serve. At this time of year we are all very busy and often think there is no time for breakfast. For those of you who like smoothies or have a nutribullet you can probably mix something up very quickly. But if you are looking for something to make you feel satisfied and full that only takes 5 minutes then traditional porridge is the answer. A bowl of quaker oats 30 grams with 225mls of skimmed milk served with 4 prunes and a drop of their apple juice comes in at 250 calories and is really filling and quick and easy to make in the microwave. This wil keep you going until lunchtime and is great on a cold morning! How did you use your extra hour? I always welcome the extra hour we get when the clocks go back and I know that yesterday I seemed to have so much more time to do things. I decided to use a bit of this to cook a lovely breakfast that feels a real treat without being many calories and is a great alternative to a full English Breakfast. 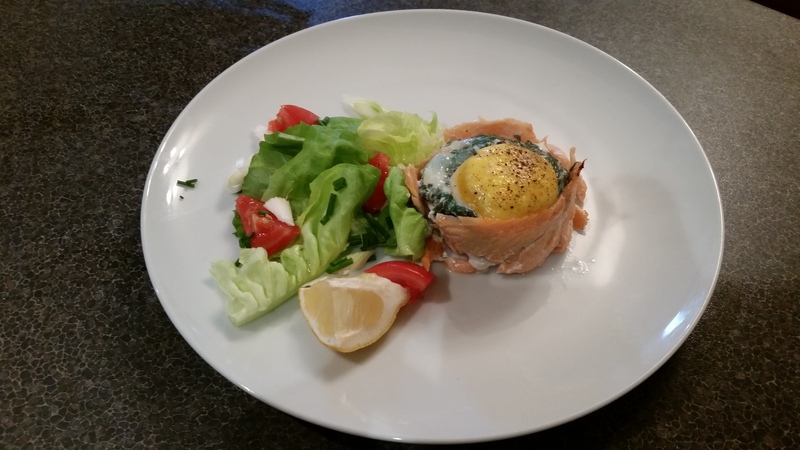 This recipe for rich salmon, spinach and cheesy pots is simple to prepare and even for breakfast I serve it with a small side salad because it is so rich. You can also use it as a starter if you are entertaining.